I live in Whistler's nocturnes. My mind is inky whistling. Seeming only barely there from behind the leaden glass. Watch me as I'm working, squeezing oil into water, pour it through blue paper. Etch a stamp into a stone then send it down the darkened river. Had the pleasure of seeing these paintings in person last October. Felt right at home. 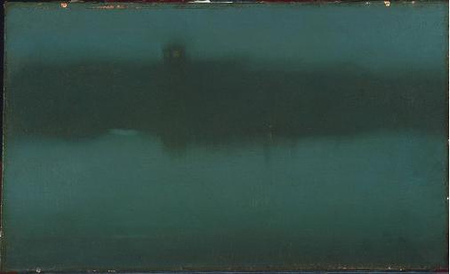 Whistler began work on his Nocturnes in the 1870's, around the time of Monet's Impression, Sunrise. Makes sense. His use of murk and abstraction appear to me as an inverted version of Monet's bright and joyful colors. Kind of how, as the Beatles released "Yellow Submarine," the Velvet Underground were recording "Venus in Furs." I count Whistler as one of my heroes. He preferred mood over narrative, strove to synthesize the harmonic qualities of music in his art, was a forerunner in non-representational painting. Also, he was an egomaniac who once sued a critic for dogging his work, then turned the whole trial into a kind of performance art spectacle about the pettiness of art criticism and authority of the artist. Yes.